Photo: Sheena Boran (left) from UM's writing and rhetoric department and Jason Solinger (right) from the English department were the co-recipients of year's award. OXFORD, Miss. – How do you make an online course as engaging as a live class and create an authentic learning experience for students outside a traditional classroom setting? The University of Mississippi Office of Academic Outreach works to highlight faculty members who are crafting online classes around these criteria each year. 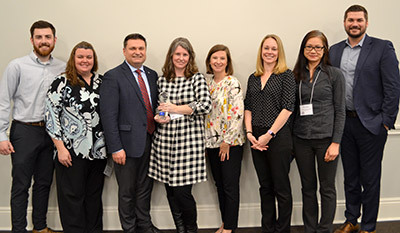 The University of Mississippi Office of Academic Outreach recently honored the top online educators at the University with the annual Paragon Award for Excellence in Online Teaching at a ceremony held on Thursday, March 21 at UM's Jackson Avenue Center. In its ninth year, the annual Paragon Award for Excellence in Distant Teaching honors the efforts of online faculty members who are exhibiting outstanding practice in course design, student engagement and a strong commitment to providing students with a quality education. "Online classes are in high demand at UM," said Tony Ammeter, associate provost for the Division of Outreach and Continuing Education, speaking March 21 at the Paragon Award ceremony at the university's Jackson Avenue Center. "There is a consistent growth of 30 (percent) to 40 percent in online student bookings each semester." The award committee reviewed 23 nominations, the most ever for this award, said April Thompson, director of the Office of Academic Outreach that houses Ole Miss Online. In fact, the competition for the top spot was so tight that for the first time ever, the award committee decided to call it a tie, she said. 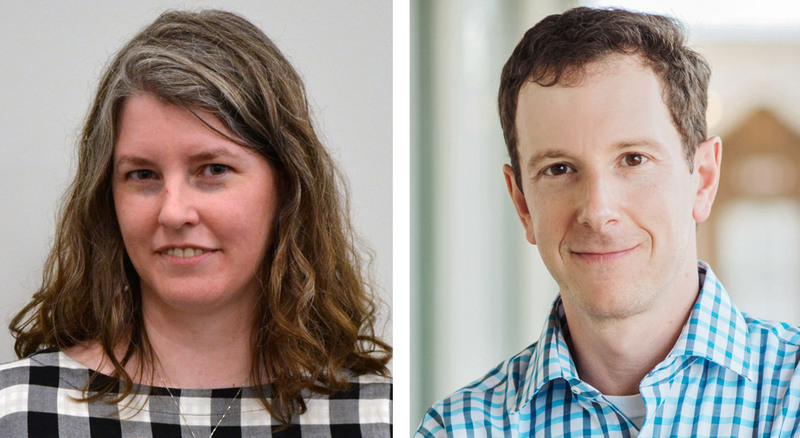 Sheena Boran, an instructor in the Department of Writing and Rhetoric, and Jason Solinger, associate professor of English, were named joint recipients of this year's award. Although they teach in different departments, they have a special connection. Solinger served as a mentor to Boran while she was working on her doctorate in English at Ole Miss starting in 2008. "It's interesting how things come back around," Boran said. "Jason is a great teacher, and I am glad to have learned from him." Boran teaches Writing 250: Advanced Composition online for the university's writing and rhetoric department. She serves on a curriculum committee for this course that has worked for the past three years to incorporate new tools and rubrics to help students in the writing process. "It's such an important class that teaches research writing in academic disciplines," Boran said. "We wanted to make it a strong, useful class for students." Boran says her teaching philosophy is simple: keep changing it up. "This online course continues to change as I learn what strategies work best for students," she said. "I regularly discover new tools to support my students' learning. It changes every semester based on what I observe in my students' work and the feedback they offer." An example of this is the elimination of video lectures in the course. "I enabled tracking statistics on the videos I posted about the writing process, and I could see that the students just weren't watching them," Boran said. "Materials are only good if the students actually use them." She said that she has since eliminated video content, relying instead on text-based documents with screen shots. "Surveys are another tool within the course that students consistently found helpful. I have found that students' performance on assignments have improved as I added more of the kinds of supporting materials they are interacting with." Boran said that she thinks emphasis on written feedback and individualized instruction through email and optional videoconferences are some of the best features of her course. "I am dedicated to providing rigorous, supportive, high-contact learning experiences that defies many of the stereotypes associated with distance learning." Boran's online courses show her dedication to teaching, said Stephen Monroe, chair and assistant professor of writing and rhetoric. "Her classes are thoughtfully planned and always engaging," he said. "She sets high expectations for her students and then encourages them toward success." As a faculty member in the UM English department since 2008, Solinger specializes in the literature and culture of the 18th century. "At the beginning of each online course-design stage, I ask myself: How do I keep every student intellectually engaged and inspire the student to love learning, to love literature, to be curious?" Solinger said. He works to help students succeed in this by offering different types of assignments that accommodate a variety of student learning styles. He has produced podcasts, narrated PowerPoints and crafted musical animations for various modules in the course. Students participate in discussion blogs within smaller groups to help create a community for examining literature. Another component of teaching online is staying connected with students in the course, he said. "In my online class, I have had video conferences to discuss writing assignments with students who are in various locations around the world," Solinger said. "I've worked with a student on an aircraft carrier in the Mediterranean and another one who was in Brazil. "Because it is an online class, I don't want students to feel that they are not working with a professor. I'm always reminding my students to email, text, phone or schedule FaceTime appointments." Student engagement in the online class often exceeds his live courses, Solinger said. "Too few students attend their professors' office hours on campus, but students in my online course speak to me frequently," he said. He also said that he thinks the online environment encouraged independent exploration through its integration of supplementary web resources into the course design. "Compared to students in my live classes, my online students are much more likely to pursue further intellectual enrichment by, for example, listening to a BBC podcast on Yeats." Solinger's course stood out to the selection committee because of its focus on each student, said Mary Lea Moore, assistant director of the Office of Academic Outreach. "He is committed to keeping online students engaged and inspired," Moore said. "If that means throwing on a clown nose to introduce a new module, then he's up for it.